Enter to Win a Gerber Life College Plan! Calling all pa rents and grandparents: You can help make your child’s dream for the future come true by entering the Gerber Life College Plan1 giveaways for a chance to win a Gerber Life College Plan. What does your child or grandchild want to be when he or she grows up? A teacher, a nurse, a scientist or anything he or she dreams of being. Very likely a college education will be needed to make that dream become a reality. To enter, visit contest.gerberlife.com between July 19 and August 29, and complete the official entry form to be entered into a random drawing for a $10,000 Gerber Life College Plan. Entrants must be 18 to 75 years old and be the parent, grandparent or legal guardian of a child who is between 1 day old and 8 years old at the time of entry. Only one entry per child is permitted. 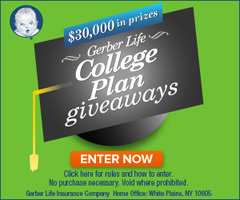 Entrants then will have a chance to win a bonus prize – a $20,000 Gerber Life College Plan. To enter the bonus drawing, just share your child’s dream for the future with family and friends via Facebook and invite them to become “fans” of your child’s dream. Once you have 20 fans, you’ll automatically be entered into a random drawing for a $20,000 Gerber Life College Plan. Winners will be announced on September 18, 2013. Hurry enter now! Visit contest.gerberlife.com by August 29, 2013. Have you started saving for your child’s college education? Will you be able to help your child achieve his or her dream for the future? The Gerber Life College Plan is a great way to put money aside for college. It can provide more security than the stock market and more growth than the average bank account – with the added protection of adult life insurance. You’ll find more details of the College Plan at www.gerberlife.com.